Once again Mosaic is supporting the yellow candle project which remembers Holocaust victims. All Mosaic members who would like a candle will be able to access one. We will need help packing the candles between 10.00 am and 12.30 pm on Sunday 14th April, at Mosaic Headquarters in Bessborough Road. We would be delighted if anyone could help for however many or few hours you may have available. Please contact Edwin Lucas on Edwin.lucas@ntlworld.com. Members of Mosaic Masorti will have candles delivered with their Pesach “Kehila”. Any Mosaic Masorti members who receive their magazines via Royal Mail, together with any members of Mosaic Liberal & Mosaic Reform should visit the Mosaic office if they would like to collect a yellow candle. This year thousands of people from across the Jewish community will be lighting a candle for a named victim who died in the Holocaust. The purpose of this project is to remember individuals whose names would otherwise be lost. The yellow recalls the yellow stars which Jews were forced to wear by the Nazis. Each yellow Yahrzeit candle provided will be accompanied by the name of a person from the Yad Vashem archives. 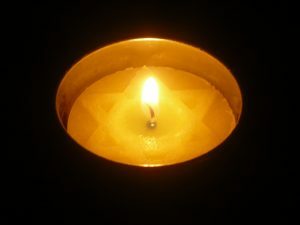 We are asking you to light your candle on Yom HaShoah evening of Wednesday 1st May in memory of the lost generation and, if possible, post a picture on social media. #yellowcandle. Last year the UK Jewish community lit 13,000 candles and this year we will be distributing 25,000 candles with the assistance of Maccabi.